Editor’s note: Will this affect you? Share with us on CNN iReport. Washington (CNN) — In an election-year policy change, the Obama administration said Friday it will stop deporting young illegal immigrants who entered the United States as children if they meet certain requirements. The shift on the politically volatile issue of immigration policy prompted immediate praise from Latino leaders who have criticized Congress and the White House for inaction, while Republicans reacted with outrage that the move amounts to amnesty — a negative buzz word among conservatives. 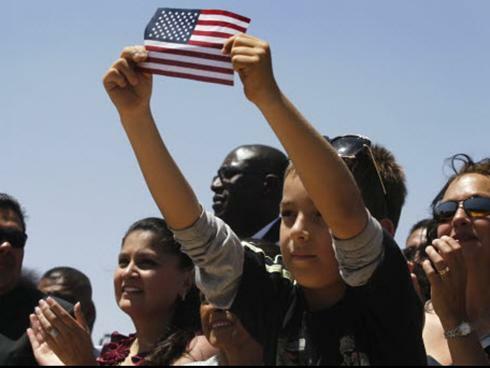 What to know on immigration in the U.S.
Those who might benefit from the change expressed joy and relief. President Barack Obama will make a White House statement about the policy change Friday afternoon. Under the new policy, people younger than 30 who came to the United States before the age of 16, pose no criminal or security threat, and were successful students or served in the military can get a two-year deferral from deportation, Homeland Security Secretary Janet Napolitano said. It also will allow those meeting the requirements to apply for work permits, Napolitano said, adding that participants must be in the United States now and be able to prove they have been living in the country continuously for at least five years. The change is part of a department effort to target resources at illegal immigrants who pose a greater threat, such as criminals and those trying to enter the country now, Napolitano said. The move addresses a major concern of the Hispanic community and mimics some of the provisions of a Democratic proposal called the DREAM Act that has failed to win enough Republican support to gain congressional approval. 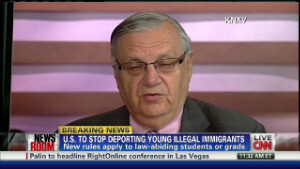 Obama has been criticized by Hispanic-American leaders for an overall increase in deportations of illegal aliens in recent years. Last year, U.S. Immigration and Customs Enforcement removed 396,906 illegal immigrants, the largest number in the agency’s history. Friday’s policy change is expected to potentially affect 800,000 people, an administration official told CNN on background. Napolitano emphasized the move does not provide a pathway to citizenship or permanent residency, and she called for Congress to pass the DREAM Act, which would put into law similar steps for children of illegal immigrants to continue living and working in the country. Republicans who have blocked Democratic efforts on immigration reform immediately condemned the move. “This is a classic Barack Obama move of choosing politics over leadership,” Graham’s tweet said. “These young people did not make the decision to come to this country, and it is not the American way to punish children for their parents’ actions,” Durbin said in a written statement. Hispanics make up the fastest growing immigrant population in the country, and the Latino vote is considered a crucial bloc for the November presidential election. A spokeswoman for a major Latino group, the National Council of La Raza, hailed the administration’s move. “In light of the congressional inaction on immigration reform, this is the right step for the administration to take at this time,” said NCLR spokeswoman Laura Vazquez. Immigration lawyers also called the change a major step in the right direction. However, one immigration expert warned that the new policy does not guarantee the result sought by participants. “I worry that the announcement will be implemented more stingily than the administration would like,” said Stephen Yale-Loehr, who teaches immigration law at Cornell Law School. “There is no fear anymore,” he said.